Nope, that stuff over there came out of my kidney over the past week since having the stent out. The urologist who did the operations on the kidney stones never fails to mention how big the stone was in my right kidney ... and I guess if this is just the random shrapnel that was left over after pulling out the big chunks, it must have been a beast. Amazingly (and thankfully), I never even had any discomfort from it, let alone pain. Of course, that's where the current stuff with the kidneys comes in. Back in May, I had a scan related to the cancer, and when the urologist was checking it, he saw a previously-unnoted stone in my left kidney, perched right over the opening to the ureter ... and his office went into emergency mode. I'd just been in for the x-ray that morning, but there it was 4pm or so, with his nurse on the phone telling me that they were trying to reserve a surgical bay, and giving me suggestions of where to go to get some mitigation of the pain otherwise. They were somewhat shocked when I told them I wasn't in any pain, and I'd see them at the appointment I had the following week. Now, we'd known about the big stone on the right side, and had been sort of ignoring it for a couple of years, but the position of the one on the left meant that pretty much any time it could shift, and I'd be in agony ... so we decided that taking care of both of them would probably be a good idea. Originally, I was going to have both sides done the same day, but they were having a problem getting all the equipment shoved up my right ureter, so they opted to set a stent in there (to stretch things out) and have me come back in a couple of weeks. It was probably just as well, as I guess they had to do like five hours of zapping to get rid of the right stone, which would have made a long day for all involved. 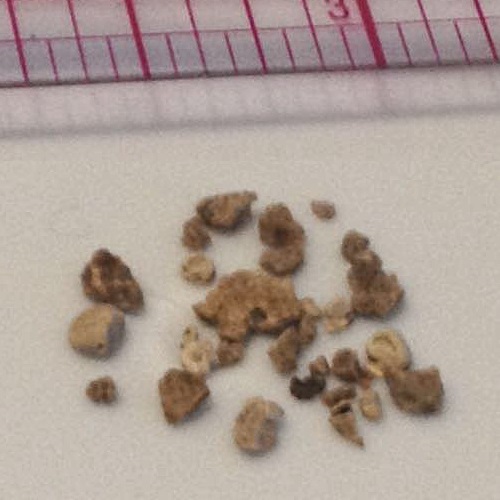 Anyway, I'm heading back in there on Monday for another hormone treatment for the cancer, so I'll be bringing in this lovely collection of kidney gravel for them to have tested. Aren't you glad to know all this?